To minister to the needs of the Parishioners through visitation, socialization and education. To minister to the needs of the Church premises through beautification and maintenance. To promote the Orthodox Christian religion with all our actions and community interactions. To always work for the benefit of the Parish. All women of the Parish are welcome to join. Meetings are usually held the first Sunday of each month in the church conference room. Dues are $10.00 annually. Here's an opportunity to not only help the church, but also to get better acquainted with your Parish sisters. We're a great bunch so please come and join us. Congratulations to Mary Ann Hildebrant for winning our Myrrhbearer's 2018 Pascha basket! The second Sunday after the Feast of Holy Pascha is observed by the Orthodox Church as the Sunday of the Holy Myrrhbearers. This day commemorates when the women disciples of our Lord came to the tomb to anoint his body with myrrh-oils but found the tomb empty. 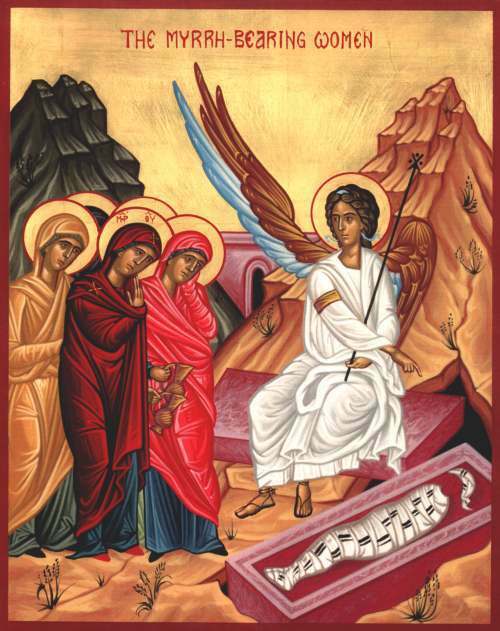 As the women wondered what this meant angels appeared proclaiming that Christ had risen from the dead. About the beginning of His thirty-second year, when the Lord Jesus was going throughout Galilee, preaching and working miracles, many women who had received of His beneficence left their own homeland and from then on followed after Him. They ministered unto Him out of their own possessions, even until His crucifixion and entombment; and afterwards, neither losing faith in Him after His death, nor fearing the wrath of the Jewish rulers, they came to His sepulcher, bearing the myrrh-oils they had prepared to anoint His body. It is because of the myrrh-oils that these God-loving women brought to the tomb of Jesus that they are called Myrrh-bearers. Of those whose names are known are the following: first of all, the most Holy Virgin Mary, who in Matthew 27:56 and Mark 15:40 is called "the mother of James and Joses" (these are the sons of Joseph by a previous marriage, and she was therefore their step-mother); Mary Magdalene (celebrated July 22); Mary, the wife of Clopas; Joanna, wife of Chouza, a steward of Herod Antipas; Salome, the mother of the sons of Zebedee; Mary and Martha, the sisters of Lazarus; and Susanna. As for the name of the rest of them, the evangelists have kept silence (Matthew 27:55-56; 28:1-10. Mark 15:40-41).